Croc Blog: Why so quiet? Hi there, my name is Adam! You might remember me from this blog which I used to update more regularly, and the CrocLog Podcast which was going pretty well there for a while. Well the truth is I've had an extremely busy few months, and I've got plenty of cool stories to tell, photos to show you, and videos to share. But right now I'm going away again. Tomorrow in fact, to an isolated island with no internet. However, very cool stuff is going to be happening there which of course I can't tell you about. Yet. My life has suddenly become very mysterious. Be assured though that I'll be back! 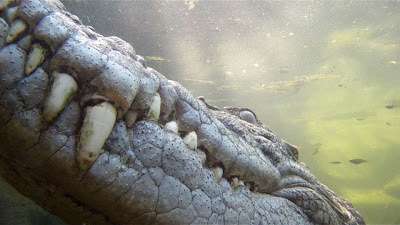 Meanwhile, Brandon continues to update the crocodilian.com Facebook page with photos, stories and news reports so check that out for your croc fix. I'll check in at the end of the month hopefully. In the meantime, I'll just leave you with this very cool picture of Smaug. I'll let you figure out how I took it.